Unlike other industries that are predominantly dormant, the beauty and fashion industry is characterized by constant changes and a proliferation of new trends hitting the market. There are many pace setters in the beauty industry especially celebs who are in the majority of peoples wish list. The just concluded Video Music Awards (VMAs) has shed light to a fresh runway glossy skin, glitter lids, twisted hair among other surprises. There are several trends that have taken a toll and are slowly becoming the norm for many especially those who are eager to keep up with the changes in beauty trends. Deep, dark and dramatic hues on the lip have predominantly engulfed the year so far. Belly like mouths have been showing up on celebrity occasions, and the trend has taken the social media by storm. More and more people are experimenting on the lips with different dark shades of strawberry black. The cat eye is timeless and remains to be one of the classic makeovers in a woman’s beauty world. However, more and more touches are cropping up to retouch the cat eye and this year has seen some of the best retouchers. The winged liner look has been the talk of many seeing numerous experimentations and applications. Beauty pageants have been rocking the rock all year round with a glistening gold shadow that couples well with a single black liner keeping the eye makeup pristine. Glitter is hotter than ever. Many people are adding a glitter to their eyelids as the new way to amp their look in 2016. This trend has seen adaptation by many people from the beginning of the year since it was shown by Baja East. Some people are also experimenting with glitter tears and interchanging between the glitter lids and the glitter tears. The look has been producing a stack of sparkle covering the lady’s dark circle, and this is not only fun but also fashionable. The simple application of using sparkles to create the tears of joy and a moisturizer that makes them stick is what has been winning the popularity of this look. Many people continue to rock the rainbow hairstyle, and it is growing in popularity. The look involves the application of different shreds of colors in your hair. For authenticity, many people were enjoying trying cutting their hair in different styles such as Mohawk and Bob before dying the different colors of the rainbow. It seems that the look is here to stay and whether you love it or hate it its popularity is continually gaining speed as more and more people are inclined to adopt the look. As some are adopting the deep, dark and dramatic hues of the famous black strawberry mentioned above, others are in preference of a more subtle color. The juicy and luring lips are losing touch for the more favorable non-touring lip color. Many people are opting for the matte look as it is sensually subtle and elegantly rhymes with the skin color revealing just enough non-shouting color and thus it’s becoming the favorite beauty look for both men and women this year. This look has not only become accepted this year but more so coveted. Many people are leaving their tweezers and letting their blows glow to luscious and full brows. Once these happens, some are opting for the color look which is the easiest and most fun way to experiment with color if one is attending a music festival or just being restless in the office. Applying the non-black mascara will ensure that you rock a moment for to capture that Instagram photo you have been yearning for. For a more solid experience, fashion experts advise that one may try mixing and matching. For example applying a bright hue lash like yellow or cobalt blue and choosing complementary slashes of eyeliner. Adopting this look will make you appear cool and current. The simplicity of this look has earned its popularity. As opposed to the heavy contoured look, many people are in love with it due to the glowy and dewy skin. With the look, the skin does not appear dry nor super matte. It's lighter foundation has made it very popular this summer since it looks more natural and not many people will know what you are wearing. 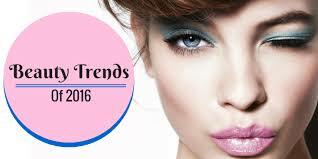 The above are the beauty trends currently trending this year so far. If you would like to try them out remember it all boils down to the shape of your face to make you get what look works for you and what doesn’t.